Recently, I experienced such a classic dose of Sod’s Law that I thought I’d share it with you as a means of differentiating it from Murphy’s Law. My American friends will only be familiar with Murphy’s Law, as Sod’s Law has no jurisdiction in the US – or at least it didn’t when I lived there. Murphy’s Law, despite its misuse, is a simple design principle observing the fact that if something can go wrong then, eventually, it will. For example: you take your new yacht on an extended voyage (or, for you people of lesser means, take your old yacht). If it is possible for the rudder to fall off, at some point, if you take enough trips, it will. That’s Murphy’s Law; Sod’s Law is more like my experience with the pedometers. My wife and I carry pedometers. 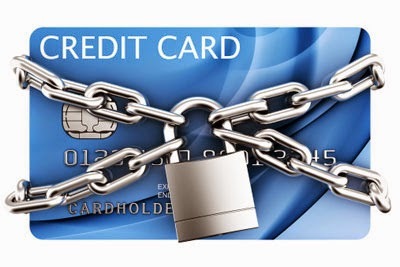 This is something you will just have to accept. We have been doing this for so long that I cannot recall a time I did not have a pedometer with me. In the early days of this experiment, we gave several varieties of pedometer a try and found most of them to be rubbish. Cheap but not very good. After a number of tries, we hit upon the Omron-III, available at our local Argos. We each bought one, and they are brilliant. 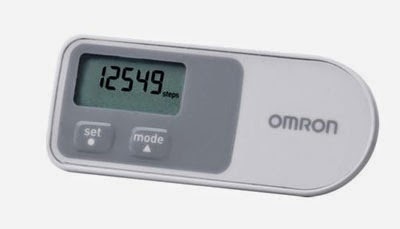 The Omron-III counts your steps, your distance, the (theoretical) number of calories burned and stores seven days’ worth of data, all in a conveniently pocket-sized gadget. And the batteries last a very long time, which is a definite advantage but also means that I have to read the instructions every time I replace one because I can’t remember how I did it the last time. As it happened, the battery in mine ran out last autumn. I replaced the battery but the device began shorting out, showing erratic numbers and then going blank. I tried resetting it but nothing worked. 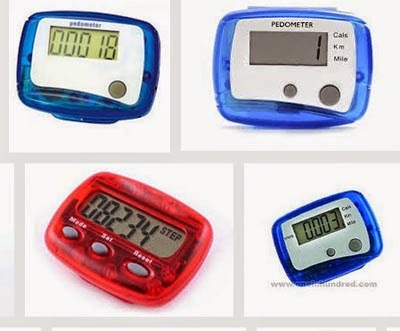 I was going to buy a new one, but then I remembered I had a spiffy new Smart Phone that did, gosh, everything, so I did a quick search for pedometers and, sure enough, there were a plethora of them. 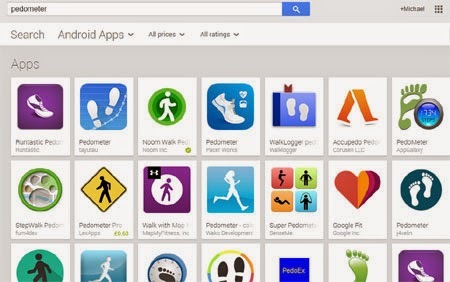 Just a sampling of all the pedometer apps available. After some research, I settled on one that was a pedometerphile’s (make sure you read that correctly!) dream: it recorded steps, calculated distance, allowed you to write notes about your daily walks (for what reason, it never said) and stored data – not for a mere seven days – but forever. It was magic! The only problem was, it didn’t actually record all my steps. On my own, I would never have known this, but I often had someone walking next to me with an Omron-III and, at the end of our walks, I would find myself shorted by several hundred steps. Even so, this wouldn’t have bothered a normal person, but my wife and I have a sort of competition over our daily steps—with 10,000 steps a day being the desired goal—and my dodgy phone pedometer dropping steps (but c’mon, it was free, what do you expect?) didn’t help my cause any. Still, I persevered; through The Move, through the Holidays and into the New Year, but it finally got the better of me and yesterday I became Officially Fed Up and proposed to Do Something About It. First, I spent some time searching for the old Omron-III on the off-chance that I might be able to fix it. I recalled bringing it with us from the old flat but its current whereabouts remained a mystery, even though I poked through all the likely hiding places and peered into things that were cunningly stored inside of other things. So, impatient to get an accurate count of my daily steps, I went out and bought a new one. Or, at least, I tried. Argos, where we bought the old ones, now sold a different model of the same brand. 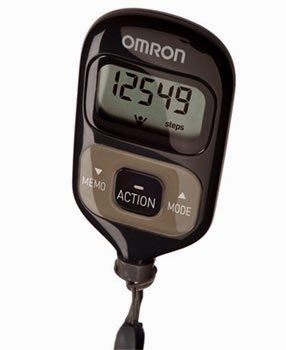 I bought it, thinking it would be an updated version with even more bells and whistles but it turned out to be the Omron-I, which did nothing but count steps—no storage, no daily steps or calories burned. Again, this would not have bothered a normal person, but going back to basic pedometry after experiencing the Omron-III would be like reverting to a dial-up modem after enjoying WiFi. (you older folks, explain “dial-up modem” to the youngsters). Your basic model -- no bells, no whistles. Of course I didn’t find out my new Omron was not as good as my old Omron until I got it home. And so, with mounting impatience, I ordered a proper Omron-III from the internet vendor everyone loves to hate, and even paid seven pounds and 21 pence for next day delivery. So now I have access to a perfectly functioning Omron-III, a brand new Omron-III (thanks to my £7.21 it is already sitting on my shelf), an adequate Omron-I and more free, but suspect, Smart Phone pedometers than you can shake a BT WiFi Hub at. I think, with all this at my disposal, I should be able to accurately record my steps to the pub, where I am heading now because I certainly need a drink. I have a birthday coming up shortly and, despite the obvious fact that it beats the alternative, I am not at all happy about it. It’s one of those milestone birthdays, you see, the round kind, ending in zero. Modern convention holds that this particular age is “the new forty” but, assuming that is so, it is, nonetheless, a dodgy knee, stiff back and "can’t remember where I left the car keys" sort of forty. Knowing this was in the offing, I began, some months ago, casting about for something new to do, something age-appropriate that I could aspire to, something I have not yet tried, that was not too taxing (or expensive) and—in keeping with my persona—a bit on the quirky side. So I decided to take up smoking the pipe. 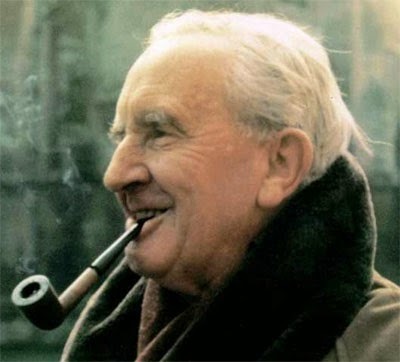 J R R Tolkien -- he looks good with a pipe, so why not me? And so, as a man on the cusp of ssss…ssssiii…that age, I proposed to take to the pipe. Is that Gandalf or Dumbledore? Unlike other hobbies I have embarked upon, I did not leap into this one. 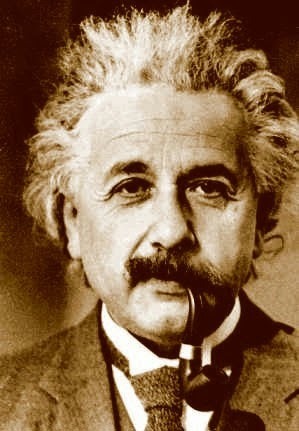 Instead, I pondered, I studied, I calculated (and, yeah, it is much cheaper than cigars) and finally decided I would buy my inaugural pipe at my favourite smoke shop, Edleeze, in Albany, New York. That this smoke shop lay on the other side of a fairly large ocean presented only a minor problem, as our yearly pilgrimage to the States was only six weeks away. In short, I went, I bought, I loved it. I loved the ritual, I loved the aroma (my wife likes the smell better than cigars, too, so that’s a bonus) and I loved the fiddling about with the matches and the tamper and the pipe cleaners. (Oh, the pipe cleaners! What a wonder to use them for what they are actually meant for. And the satisfaction one gets from cleaning out a pipe! It’s magic.) It felt natural, it felt right, it felt like something a man entering his “new” forties should be doing. 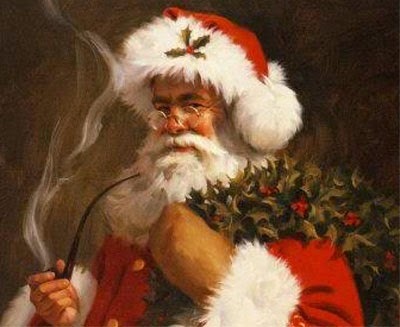 Upon my return to Britain I began alternating between cigars and the pipe (you didn’t think I gave up cigars, did you?) and with every bowl discovered I liked the pipe more and more. But then I began to run low on tobacco, and I was down to my last few pipe cleaners, so I set about looking for replacements. That’s when things got ugly. Have you ever tried to find pipe tobacco in a town that doesn’t have a tobacconist? Have you ever tried to find a town that has a tobacconist? Horsham used to have one but, like most of the others, it closed down years ago. Tobacco now is sold mainly by super markets, but pipe tobacco is such a rarity that some of the people I tried to buy it from didn’t even know what I was talking about. At one super market, the woman minding the Cabinet Of Death told me they did, indeed, sell pipe tobacco and sold me a pouch. I hurried home gleefully, only to discover it was actually cigarette rolling tobacco. So I gave it to the kid next door and went out to try again. This time, I did some research and found a super market that did sell pipe tobacco and found the name of a brand I could ask for. So I went and asked and the woman minding that particular Cabinet Of Death sold me a pouch and I hurried home gleefully only to discover it was actually cigarette rolling tobacco. So I gave it to the kid next door and ordered some on line. 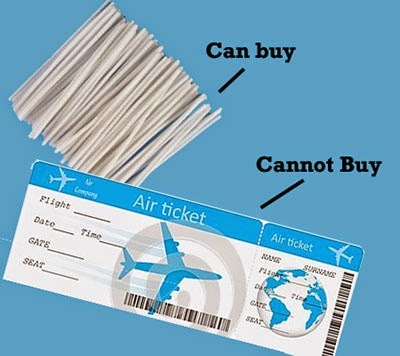 That solved the supply problem, but the next day I scoured the town in vain for pipe cleaners and ended up ordering them on line, as well (those 300 pipe cleaners I spoke of in my previous post). I had to be very careful with my order because almost all of the pipe cleaners I viewed were for arts and crafts and, as delightful as red, blue and purple pipe cleaners are for constructing dubious furry animals, they are rubbish at cleaning a pipe. Now I need more pipes! 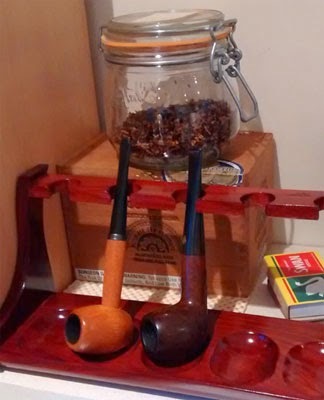 Thankfully, I am now fully stocked, and today my son sent me a nifty pipe-rack for my birthday; the first, I suspect, of many pipe-accoutrements. 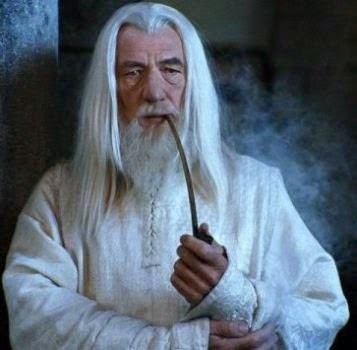 When my birthday arrives, I will already be an inveterate pipe-smoker, and this pleases me because, if I have to be a “man of a certain age,” I at least want to look the part. I'm thinking of getting my hair done like this, too.